Elise Ellsworth awakens in Rambling University in the fall of 1954, her memories as shattered as her legs. She has suffered an accident, one which mirrored the allegedly accidental death of another student the term before. Authorities both of the campus and the nearby town deny any connection. Elise and the rest of the staff of the school’s newspaper take it upon themselves to solve the case — a case that is nearly ruined when Tarian Marek, a junior with a mysterious agenda, catches her trying to steal a dead student’s records. Surprisingly, he promises to help her. But making new allies is a dangerous game when anyone could be a killer … and anyone can be, when everyone in town has superpowers. 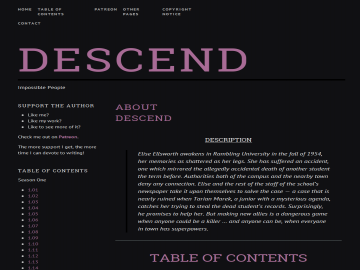 Descend has not been reviewed yet. Descend has not been recommended yet.